Recently I had to reinstall my Windows as the OS had totally got screwed up. After the fresh install of OS I reinstalled MS Outlook and when I configured my e-mails accounts using POP3 protocol the older e-mails which had already been downloaded also got re-downloaded there by creating lot of duplicate e-mails. This happens because POP3 protocol is not capable of remembering the e-mails that have been downloaded already whereas the IMAP protocol is capable of tracking these details. So if you happen to use IMAP protocol then you will not such issues. Removing each entry manually takes hell a lot of time and sometimes this is irritating. 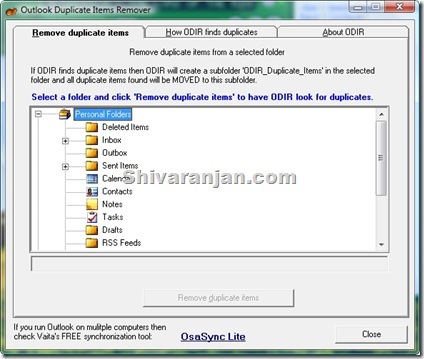 Now comes Outlook Duplicate Items Remover (ODIR) which is a free software that you can use to remove duplicate contacts, tasks, appointments, notes and e-mails. How does Outlook Duplicate Items Remover work? - unsent emails: email subject only. The best part when get the job done by ODIR it does not delete the duplicate items but moves to them to a folder called ODIR_duplicate items from where you can analyse delete the items that you don’t require any more. When I used this tool it was very efficient and it found out all the duplicate e-mails correctly I was clear my mailbox with much ease. This software has found its place in my must have software lists. So if folks if you are using Outlook then you should have this tool as you never know when you would need this.